Maiolica is a type of low-fire ceramic earthenware covered with an opaque white tin glaze and decorated with colored pigments. Maiolica pottery was especially popular in Italy during the Renaissance. Maiolica, the refined, white-glazed pottery of the Italian Renaissance, was adapted to all objects that were traditionally ceramic, such as dishes, bowls, serving vessels, and jugs of all shapes and sizes. It was also used as a medium for sculpture and sculptural reliefs, as well as floor and ceiling tiles. Maiolica is distinguished by its white, opaque glaze, due to the presence of tin oxide, a powdery white ash. Tin was an expensive imported substance, which made maiolica a far more expensive commodity than ordinary pottery. Great care was taken to refine and shape the local clays, which varied considerably in color and weight. The tin-glazed surface was smooth and shiny but not brilliant. In the sixteenth century maiolica workshop procedures applied a second, clear glaze to maiolica objects, which produced a brilliantly shiny surface and enhanced the color decoration. The tin glaze itself was a mixture of the elements of ordinary lead glaze and tin oxide. This was liquefied with water and (most likely) a little gum arabic, into which the clay objects were dipped. When thoroughly dry, the surface was ready to be painted, a difficult process requiring great control by the painter, as the surface in its pre-fired condition readily absorbed the pigments, themselves dry powdery metal oxides mixed with a little water and perhaps gum arabic. Around 1430–60, the range of colors available for decorating maiolica expanded from purple-brown derived from manganese and green from copper, to blue from cobalt. By the early sixteenth century, a full range of colors was available. Wheb Italian majolica was invented? Florence led the way in the fifteenth century in the production of maiolica. The output of the city’s workshops represented a technical and aesthetic advance on the process as it was learned from Islamic Spain (it is not known who introduced the technique into Italy). Before the turn of the sixteenth century, important centers in Naples, Pesaro, Faenza, Rome, and Deruta were making fine maiolicas. From the sixteenth century, surviving examples of great beauty were made in Forlì, Cafaggiolo, Castel Durante, Rome, Urbino, and Venice, as well as several places in Sicily. For important commissions, sources of design were either new drawings incorporating the arms and insignia of the client for one-of-a-kind pieces, or prints and other available drawings that were often repeated in an early form of mass production for a larger popular market. Maiolica is made by first sourcing clay from the earth and kneading it into consistent mass to eliminate air. To begin forming the clay into a shape, also known as the process of “throwing,” potters use a spinning circular platform. This device has a circular base which the potter controls by foot in order to keep a consistent speed. The potter centers the clay on the spinning wheel, exerting pressure by hand to form the shape of the clay object. Sometimes molds are used in order to duplicate an existing ceramic design like a plate. When throwing clay using a mold, the potter will first center the mold on the wheel, and then center the clay mass over the mold and press it into the mold. Potters sometimes rest their hands on a bar extended over the wheel in order to keep them steady while removing excess clay to make it uniform over the mold. Once the clay is formed into the desired shape, it is fired in a kiln. A kiln is an extremely hot oven used specifically for hardening ceramics. Traditional kilns were heated with a wood-burning fire. Fires produce ash, smoke and gas, which can damage vessels. To avoid such damage, Renaissance potters would place fine vessels inside a special refractory clay container that better withstood extremely high temperatures. After the ceramic object is removed from the kiln and cools, it is coated in a white tin glaze. This creates the opaque white ground that maiolica is known for. Sometimes an artist’s fingerprints are visible in the white glaze, usually at the base of the ceramic object where it was held to dip into the glaze. When the white glaze is dry, paint is added to the ceramic object. Renaissance potters were limited to mainly blue, green, and earth-toned pigments. When finished with the decoration, the potter fires the work a second time in the process known as the “gloss firing.” This fuses the glaze and pigments to vessels, giving maiolica its distinct glass-like finish and preserving its bright colors. The majority of maiolica produced during the Renaissance was intended for practical use. Tableware like plates, bowls, and jugs were quite common, as were tiles, inkwells, candlesticks, and devotional reliefs. Maiolica drug jars, like the piece at the left, were also commonly used to store herbs and medicines. The majority of maiolica pieces that remain today are of fine quality. These high-end works, such as the elaborately decorated basin seen below, were typically used only for display or special occasions. This basin was possibly made by or in the workshop of Orazio Fontana, who was one of the most sought-after and innovative ceramicists active in mid-16th-century Italy. He helped develop a new genre of maiolica directly inspired by Raphael’s frescos, and this basin depicting a Greek mythological scene reflects the ornate style of many 16th-century maiolica wares. The unique qualities of maiolica production and design have allowed stunning examples of this form of decorative arts to survive since the Renaissance. How were Renaissance majolicas decorated? The decoration of maiolica was variable according to the tastes and traditions of the town which produced it or according to the requirements of the patron who commissioned a service. Plates could be decorated with heraldry, religious scenes, or animal or plant motives. The entire outer surface of a dish or pot could be covered with highly colorful narrative scenes known as istoriato or “story-painted” maiolica. The stories depicted, often deriving from ancient mythology, the Bible, or classical history, were much in demand. 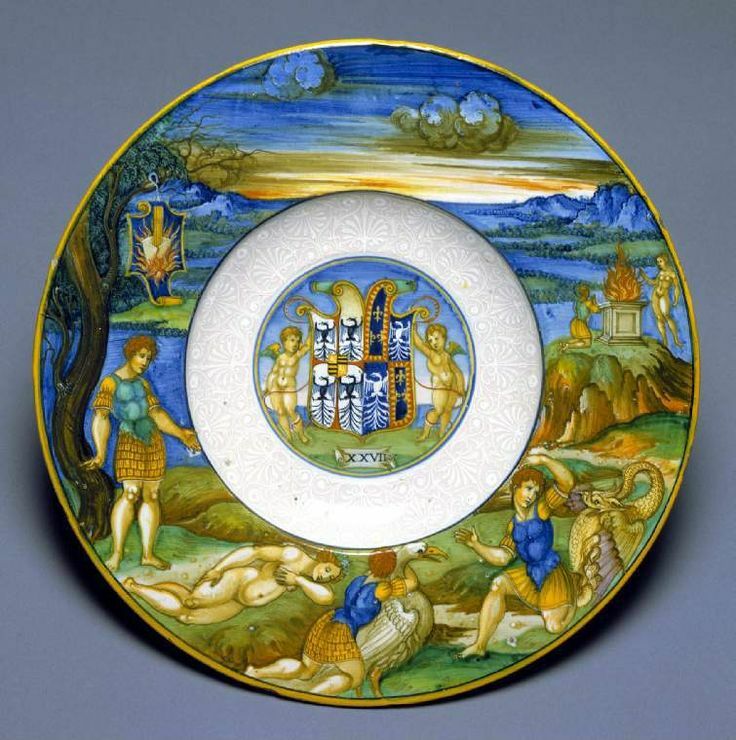 Whole sets of istoriato maiolica were ordered by wealthy Italian families. A set was famously ordered by Eleonora Gonzaga as a gift for her mother, Isabella d’Este, in 1524. During the sixteenth century, the finest Italian maiolica such as istoriato was regularly commissioned by or for the richest, grandest, and most discriminating people of the time, both Italians and foreigners. What are the differences between tiles and pottery? Pottery is an ornamental or useful ware shaped from moist clay and hardened by heat. The type of clay used and the temperature at which it is fired give pottery a different appearance and strength. It is also know as bisque or biscuit and it is fired at low temperatures – 1800° to 2100° Fahrenheit. It is usually reddish or white. Due to its high porosity, earthenware must usually be glazed to enable it to hold water. Earthenware pieces have been found that date back to1400-1200 BC, making this craft the oldest pottery in history. It is made of a heavier clay mixture, which can be fired at much higher temperatures – 2200° to 2400° Fahrenheit. It is dense, impermeable and hard enough to resist scratching by a steel point. It’s brownish gray and it can be used both blazed and unglazed. Ideal for cooking and baking. It’s made of a specific clay, containing kaolinite, and it is fired at high temperatures – 2200° to 2500° Fahrenheit. It is hard, impermeable (even before glazing), white, translucent and resonant. Maiolica is the beautiful ware prepared by tin-glazing earthenware and firing it a second time. After the first firing, the bisque is dipped into a bath of fast drying liquid glaze. When dry, the glazed piece is ready to be hand painted. A final firing at 1690° Fahrenheit will make the glaze interact with the metal oxides used by the painter to create the deep and brilliant translucent colors specific to majolica.